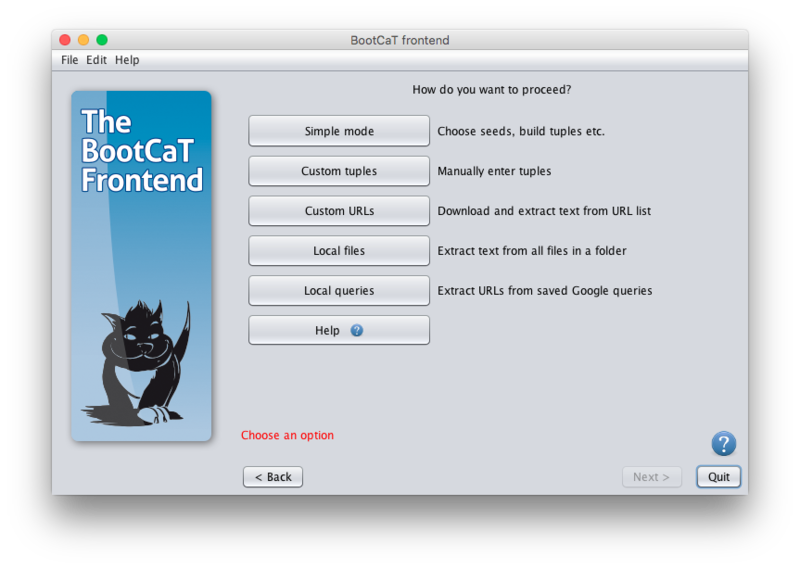 Welcome to the BootCaT front-end tutorial! 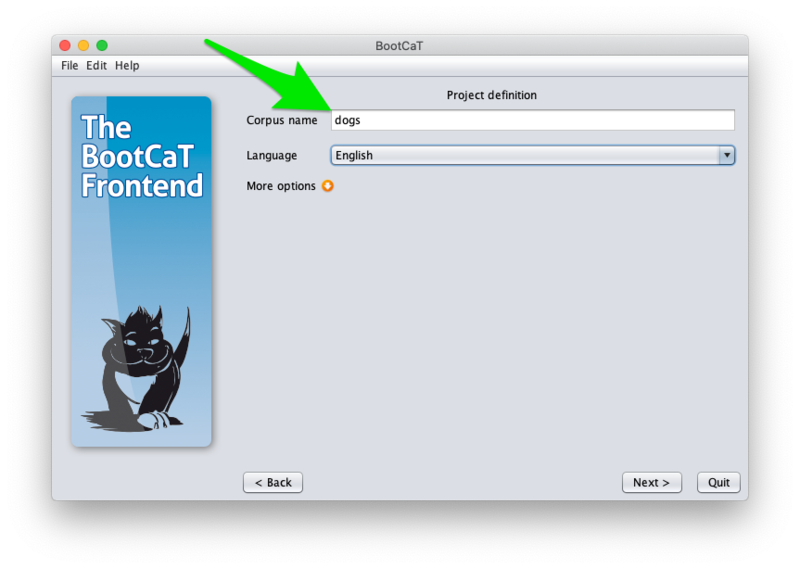 This short and simple guide assumes no prior knowledge of the tool, and will walk you through the process of creating your own web corpus using the BootCaT front-end. 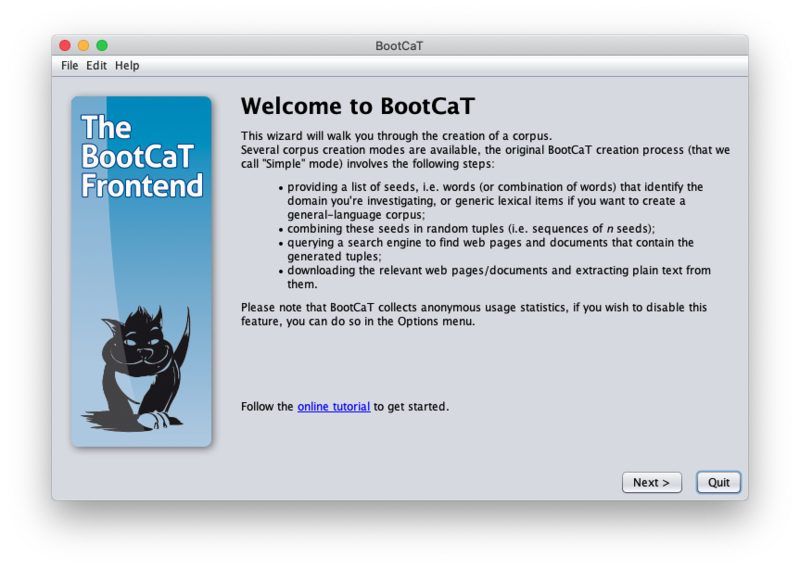 This is the welcome screen, where you'll find some basic information about the BootCaT method for creating a web corpus. when you run BootCaT front-end for the first time a new folder named “BootCaT Corpora” is created in your home folder (or your “My documents” folder if you're on Windows). You can see all your corpora by clicking on “My corpora” in the File menu. Here you have to choose a name for your new corpus. For example, insert the name “dogs” in the box. You also need to choose a language/country combination. Let's choose “English - United Kingdom” from the drop-down list and click “Next” to move on to the next step. In this step you need to choose which corpus creation mode to use, click on “Simple mode”. For more information on the more advanced options (i.e. “Custom tuples”, “Custom URLs”, “Local files” and “Local queries”, see this page).